In his early years Michael went to North Lancing and The Vale junior schools, before going to Sion School in the centre of Worthing to take his GCSEs and A Levels. He then gained a degree in Classics and English Literature from the University of Exeter, a Russell Group university. After graduating, Michael left Exeter for London, working at a FTSE100 publishing company and later co-founding a media recruitment company. Michael joined the family outdoor business in 2009 and remains part of the e-commerce management team for Europe's second largest online outdoor retailer. Michael also helps run his wife's business, an online American candy company. 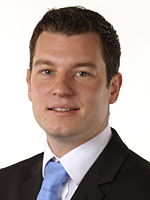 Michael was elected to Worthing Borough Council as Councillor for Salvington Ward in May 2012. As well as working on the Licensing, Planning and Joint Planning committees, Michael is Chairman of the Joint Members Appointments Committee, and IT Policy Adviser to the Cabinet Member for Resources. Michael has been a life-long supporter of the Chanctonbury Community Play Scheme (CCPS) and devoted many voluntary hours to help special needs children and their families each summer. Never afraid to push the boundaries for a good cause, in 2007 Michael was part of a four-man team that took an old Ford Fiesta from London to Mongolia, raising thousands of pounds for Mercy Corps Mongolia, a charity supporting rural communities with their social and economic needs and Send a Cow, a charity promoting self-sustainable farming and livestock breeding in sub-Saharan Africa. As well as bringing up their own children, Michael and his wife are foster carers. Both feel strongly about championing children's welfare, and improving the lives of children who come to be cared for by West Sussex County Council.